Fernando Pérez is a research scientist at UC Berkeley’s Henry H. Wheeler Jr. Brain Imaging Center; he works at the interface between high-level scientific computing tools and the mathematical questions that arise in the analysis of neuroimaging data. 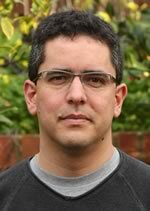 Pérez is committed to creating better tools for scientific computing based on the Python language. He created the IPython project while a graduate student in 2001 and continues to lead the project, now as a collaborative effort. He is also an active member of the community that creates freely available scientific computing tools around the SciPy stack, lectures regularly about scientific computing in Python, and is a founding board member of the NumFOCUS foundation. At UC Berkeley, Pérez is involved with a number of efforts to improve the quality of the computational practices of scientists and educators.